Stitch is designed to help members make new social connections in a variety of ways. 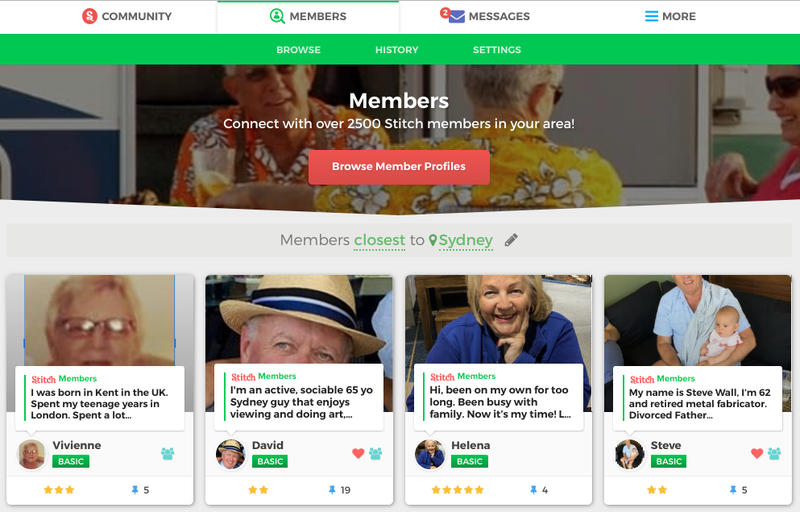 The Community section on Stitch consist of Stitch Groups, Activities and Chat, all designed to help connect you with other members in a community setting, meeting lots of like-minded people by doing things you enjoy. 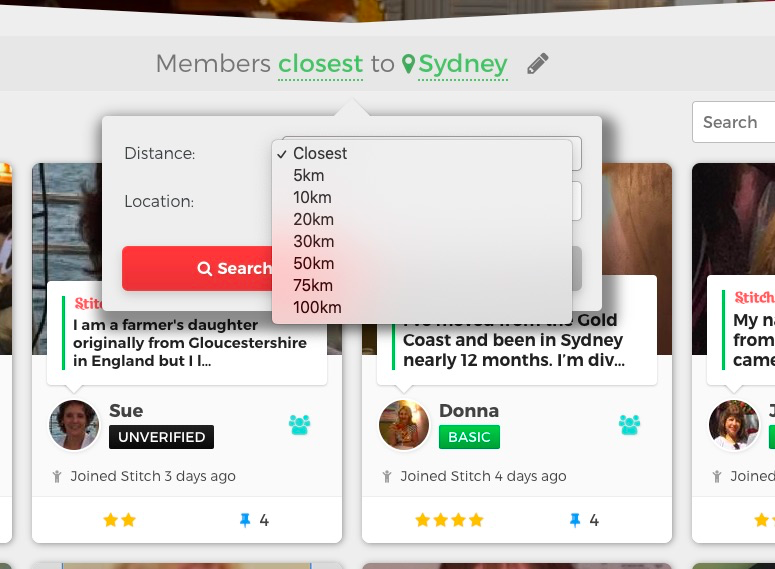 The Members section on Stitch, on the other hand, is designed to help you connect one-on-one with other members of Stitch. Whether you are seeking new friendships, a romantic relationship, or are trying to reach out to members near you to help create a Stitch community in your area, the Members section can be used to connect and initiate one-on-one conversations with other members. 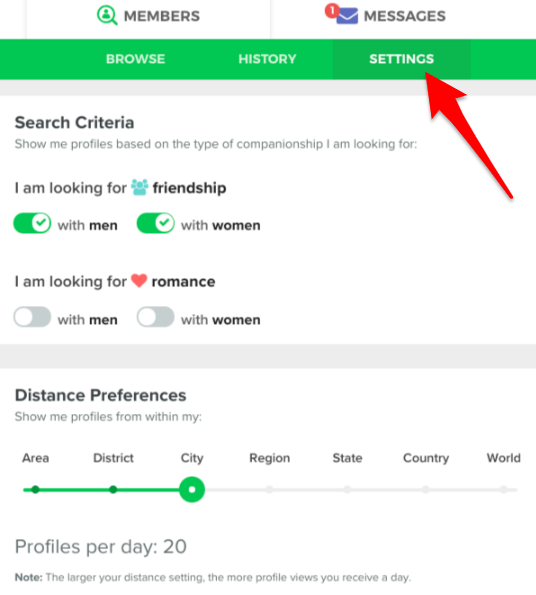 The Browse settings page is where you specify you companionship search criteria, such as whether you are seeking friendship, romance, or both. Each of these pages is explained in more detail in the sections below. You can view the Members page by selecting Members in the main Stitch menu. The Members page will show you all Stitch members in your local area who have completed their profiles and verified their accounts. If you are a Basic, Bronze, or Silver member, the Members page gives you an insight into what the other members of your Stitch community are like, and is the launching point for Profile Browsing, which is how Stitch introduces you to other members in your area one at a time. To start browsing member profiles, simply select the Browse sub-menu at the top of the page, or select one of the member profiles on the Members page. Profile browsing is explained in more detail here. These features are extremely powerful, which is why Stitch only opens them to members who have shown themselves to be valuable and trustworthy contributors to the community by earning Gold status or above. Gold, Platinum, and Diamond members have earned their status by making meaningful contributions to their Stitch local communities by organizing events and activities, convincing new members to join, or helping build the local community. The Members page lets them take that a step further, allowing them to reach out to new members in their area to welcome them to the community, invite them to come to events and activities, and otherwise build connections with other local members. It's a privilege that Stitch doesn't grant lightly, which is why it's only available to members who have proven themselves to be trusted members of the community. Ability to list members in locations other than their own. A member based in Sydney, for example, might have a trip to New York coming up and want to reach out to members in Manhattan prior to travelling. Changing the location can be done by selecting the pencil icon, as in the image below. Ability to use the search bar to filter members by name. Simply type the person’s name you are searching for and all members with that name will appear. These options are designed to help our Community Champions reach out to new members of the community to ask them to join Stitch Groups, invite them to Stitch events, and get them involved in Stitch. New members often feel intimidated when first joining Stitch. A personal invitation to join a group, activity, or even just a simple hello from an existing member will do wonders in boosting their confidence and alleviate some of their fear in joining the community! The Stitch Browse page is where Stitch introduces you to other members one by one, based on your search settings. Profile browsing and how to use the Browse page is explained in detail here. As mentioned above, members whose status is below Gold can interact with only the number of people that their membership plan allows. Members who have reached Gold status or above can skip, message and save an unlimited number of profiles per day. The individual profiles that are presented to you on the Browse page are based on what you have specified on the Settings page. In the example above, this member is looking for friendship with both men and women, with people in their local city. So all the profiles they can see in the Browse section will match this criteria. In the Search Criteria section you can change what type of companionship you are looking for and from what gender. You can also change the location of the people you are searching for. In the Distance Preferences section, moving the green dot toward the left narrows your search results to people in your local community. Moving the green dot to the right exposes you to people in the wider Stitch community. Both these sections can be changed at any time. The History page is, as its name suggests, the place where you can view a list of all the profiles you have seen, along with the decision you made on each one. Learn more about this page here.